I’ve been going bonkers for peaches this year. It may just be my pregnancy tastebuds, but the peaches seem particularly ripe and sweet in upstate NY. In keeping with my cravings for strong flavors, I decided to make a Summer Peach Salad. It was a symphony of summer flavors that was beyond amazing. In fact, I made it again the next night for dinner! 1. Set your grill to medium heat and allow it to reach the desired temperature. 2. Place the peach halves, cut-side down, directly on the grill over indirect heat (to the side of the flame). Cook for about 1 minute and then remove from the grill. 3. Slip off the warm skin from the peaches and cut them into slices. Set aside. 4. 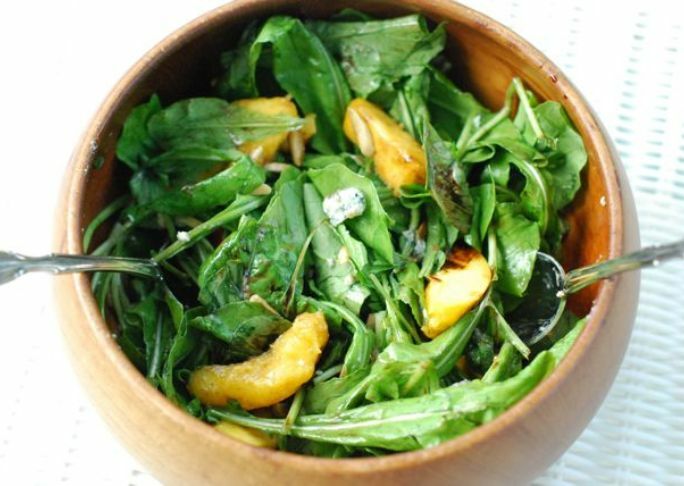 In a large salad bowl toss the dried arugula, blue cheese, and almonds. 5. Top the salad with the peaches slices and drizzle with the balsamic reduction.